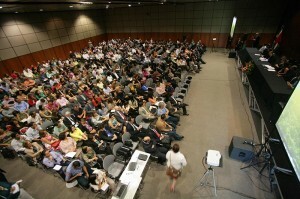 RIO DE JANEIRO, BRAZIL — Speaking in Rio on Wednesday (August 20th), Gustavo Ungaro, president of the National Council of Internal Control (CONACI), defended the proposed amendment to the constitution (known as PEC 45) that would see a change in control of public administration and is currently under review in Brazil’s senate. Corruption remains a major concern of many Brazilians and the annual meetings see delegates sharing experiences and ideas for improving the country’s internal regulations image by Everaldo Birth/Hangar centro de convencoes. “The approval of PEC 45 would mean the consolidation of an open model of self-control, which contributes to improved management, respecting the autonomy of federal agencies,” Ungaro said at the opening of the 10th National Meeting of Internal Control in Rio. Created in 2007, the CONACI is an institution that oversees the internal control organs of Brazil’s governance including state councils, federal districts, capitals, state secretariats of transparency and auditing. Members of the Council also used the opening to criticize the delay in the regulation of Law 12,846, popularly known as the Anti-Corruption Law. In discussing national anti-corruption measures, the president of CONACI argued that similar laws could be applied to states and municipalities. He said the federal regulation is the basis for the application of penalties to agents of corruption in both government and the private sector. During the two-day meeting in Rio, CONACI will undertake its first survey of results in the states and capitals where the law has been applied. In support of efforts to combat internal corruption, the UN resident coordinator in Brazil and representative of the Program for Development (UNDP), Jorge Chediek highlighted the engagement of the population and the Ficha Limpa (Clean Record) Law which prohibits politicians convicted of crimes to hold public office. “Fighting corruption is key to consolidating democracy. Complaining is important, but we must actively engage in building strong institutions,” Chediek said.